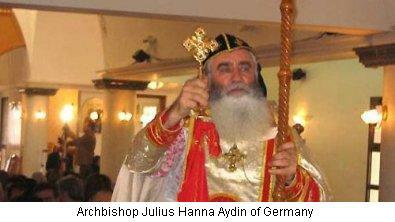 (AINA) -- The Patriarch of the Syriac Orthodox Church, based in Syria, has suspended Archbishop Julius Hanna Aydin of Germany, according to the EasternStar News Agency. According to Archbishop Aydin, his suspension is because a powerful block of pro-Syria bishops in the Church opposes him because he is not a Syrian national. Archbishop Aydin was one of the founders of the Aramean movement in Europe, which held that Assyrians are Arameans. This caused a schism within the Assyrian community and within the church body. Today Archbishop Aydin his recanted his support for the Aramean movement and regrets having caused divisions within the Assyrian community. "Assyrians, Arameans and Chaldeans, no matter what we call ourselves we are one people and must be united." he says. According to some Assyrians in Germany, the Syrian secret service (mukhabarat) has undue influence over bishops in Syria and is attempting to divide Germany into three different Episcopal sees to more easily control the Assyrians. Some church officials have stated that Syria does not want the Assyrians to unite. Archbishop Aydin, they point out, constituted no threat to the Syrian government and its representatives within the Syriac Orthodox Church in Germany when he was an anti-Assyrian. It was when he advocated unity, when he started building bridges between different groups that he was stopped.